Over the past 15 years Vagabond and Driftwood tours have been honoured with several prestigious awards, both at home and internationally. This award means so much to us. We earned it because of the excellent reviews generated by our guests, it tells us we must be doing something right and reassures our belief that we have the best guides in the world! In 2013 we were delighted that our 8 day ‘Wild Irish Rover’ tour was chosen as one of their ’50 Tours of a Lifetime 2013‘ by The National Geographic Traveller Magazine. 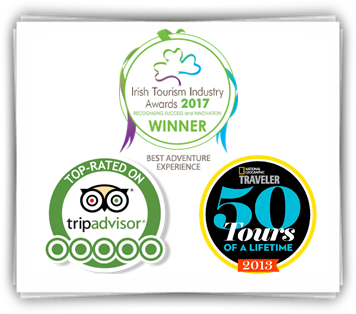 Vagabond was the first Irish company to be chosen as a top 50 tours of a lifetime, which added to our pride and excitement! In April 2015 and in February 2017, Vagabond Tours of Ireland took home the prize of: Best Adventure Experience 2015 and Best Adventure Experience 2017 at the Irish Tourism Industry Awards. The biennial ceremony showcases the country’s most successful and innovative tourism products, services and experiences.